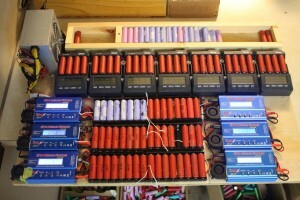 This is going to be the first post in my solar battery project series. For several months now, I have been collecting laptop batteries and breaking them down to harvest the lithium ion 18650 cells inside. 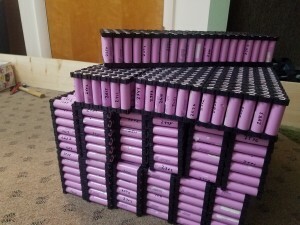 My goal is to use them to build a large battery bank to store solar power. This project has been going on for over a year now, but unfortunately, I haven’t been documenting it. Going forward, I’m going to try to document my progress along with pictures/details of my built. Please read the safety disclaimer at the bottom of this post before continuing any further. Up first, is the cell charging and testing board I built a few months back. Once you extract the cells from laptop backs, each one has to be thoroughly tested to ensure the cell is good and safe to use. 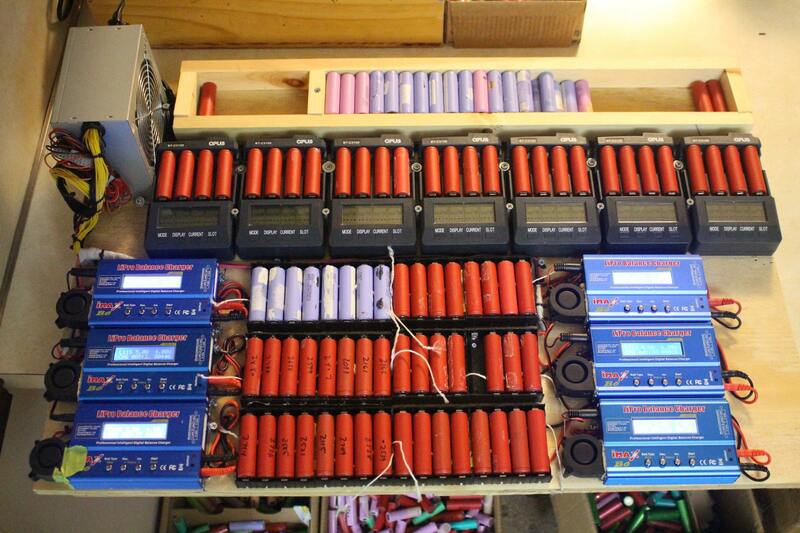 The charging board you see below is equipped with 7x Opus BT-C3100 chargers and 6x SkyRC IMax B6 chargers. The entire board is powered by an old ATX computer power supply that has been modified to output a single large +12V rail. This avoided the need to have 13 wall transformers piled up along with a rat nest of AC cables. The entire board is built so I can simply pick it up and move it when needed. Everything is bolted down. Before cells even make it to the testing board to be capacity tested, a volt meter is used to check the initial cell voltage. Anything less than 1.0V is put in a separate bin to be recycled. Most healthy cells should be above 2.5V, but because I’m working with batteries that I know sat for several years, I’m using 1.0V as my threshold. The second step is to completely charge them up to 4.2V full charge using the IMax chargers you see at the bottom of the board. The Opus chargers handle the capacity testing and their time is important, so to get as many cells pushed through as possible, I want them to enter the capacity testing stage with a full charge. Anyway, each IMax charger is charging 8 cells wired in parallel at 5.0A. That means each cell is initially charged at 0.625A. It could be a little more or a little less depending on how out of balance the 8 cells are when they are first put in. I’ve had people tell me lower voltage cells could be charged too quickly if paired with higher voltage cells. I have personally charged over 5000 cells like this and never had a single issue, so I think that argument is discredited. The IMax chargers tend to get a bit hot, especially when stacked so close together. To help dissipate the heat generated, I modified each IMax with a squirrel cage fan on the side. In my tests, this kept the charger a whopping 30 degrees (F) cooler when charging at 5.0A than without the fan! The fans were cheap and only a few dollars, so I’d definitely recommend adding them if you notice your chargers getting warm. Once the cells are fully charged to 4.2V, they’re moved to the Opus chargers. I am using the Charge Test cycle. This means the Opus charges the cell up to 4.2v, then discharges to 2.8V, then charges back to 4.2V. This is all done at 1.0A. Once the discharge phase is complete, the cell’s capacity in mAh is displayed on the screen. 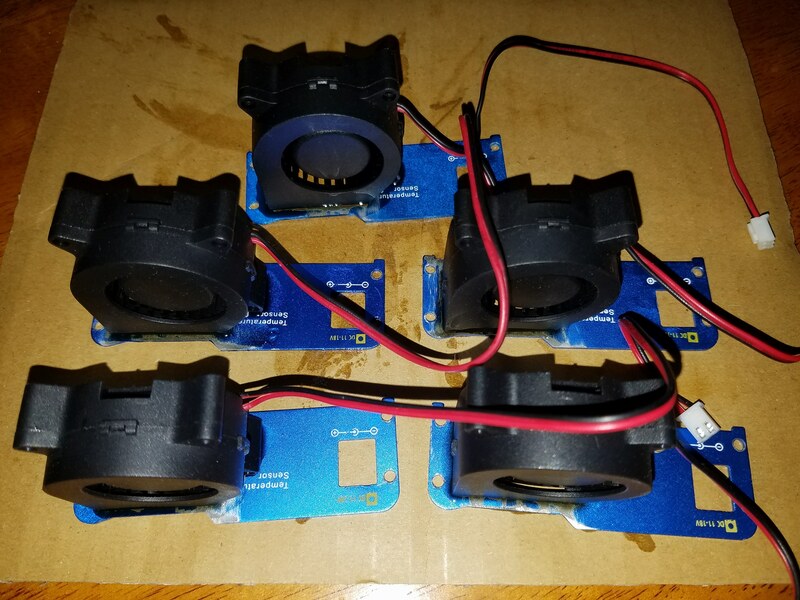 Once the capacity is shown, I’ll usually pull them out and stick back in the IMax to charge back to 4.2V, because again, the Opuses time is valuable and want to make sure it’s being used as efficiently as possible to test as many cells as possible. At this stage, cells testing lower than 2000mAh are discarded. These cells may still be good but the capacity is below what I’m considering usable for my project. This threshold will most likely be raised in the future as most of the newer cells I’m testing have capacities much higher. It’s important to note that heat is monitored at all stages of charging and discharging. If at any time, I stick my hand on some cells and it feels hotter than the rest, the cell is removed and recycled. I do not have a set temperature and I know everyone’s hand is different. This is what works for me, it won’t necessarily work for you. Once the cells are capacity tested and charged back to 4.2V, they are put in a box and let sit for 2-3 weeks. After sitting, I check again with the volt meter and discard anything that has dropped under 4.10V. This is to weed out any cells that are showing signs of self-discharge. Using cells that are self-discharging, even a tiny bit, in your project will eventually throw your packs out of balance and cause additional problems down the road. Once the last stage is complete, cells are put in packs of 120 and ready to be fused/soldered. This will be covered in a future blog post. It is important to note that lithium ion cells can be very dangerous if misused, especially since we are working with used laptop batteries. This could mean fire or personal injury. This blog post is intended to document my project journey for educational purposes. It is not intended to be a “how-to”. Do not try this at home. Always consult a licensed electrician before doing any kind of electrical work. This entry was posted in Solar Power Project. Bookmark the permalink.